Seeing the Gitter chat you can see some of the same questions are repeated very often. People ask about how to contribute, how to install Robocomp, etc. I wanted to have a page you can suggest to them. Updating and rewriting the docs made me realize something, Robocomp docs cover a lot (!) of information. So doing a little summary and telling people where to find answers it’s a good idea. I started wirh the basics: How to contribute? How to install Robocomp? I want to help! What do I do? In which branch should I make changes? 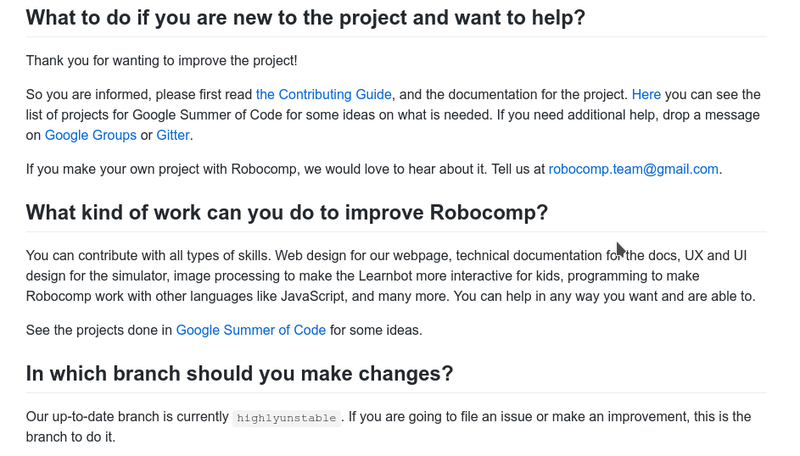 Then I added some more: What is Robocomp? What is the Learnbot? How to use other OS? How should you file an Issue? When I finish the last two questions I’m adding it to the main page of the Repo (Readme.md). If you have a question you want to add please do! If you have a suggestion to a question you can email me.